It’s been a while since I’ve done a garden post, so I am rectifying the situation today with a wonderful early summer flower. Did you know that peonies (family Paeonia) come in more than just the herbaceous variety? Herbaceous means they die back to ground level every winter. Most of us are familiar with that type. They’re extremely common in garden centres and cost about $15-$20. Herbaceous peonies are very long-lived perennials given the right conditions. Once you have them you have them pretty much for life unless you do something nasty to them. They also resent being moved once established. Think of your grandmother’s garden. If you remember a peony when you were young chances are that it’s still growing. They can keep coming back for decades. I know of some that are in excess of 60 years old and still perform wonderfully. 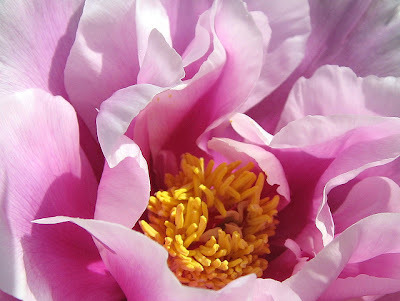 What is a tree peony? Tree peonies are different. Rather than being herbaceous, they are woody which means the stems last through the winter and new growth appears on the developed branches. They have beautiful, blousy flowers and are hardy through Zone 4 (USDA Zone 3). Like their herbaceous cousins they also have a sweet scent. Tree peonies are a little more difficult to establish but are worth your effort. I’ve had several for at least 8 years. It’s taken a while for them to settle in but now they have I expect exponential growth. I have had a few disasters where they died but I believe it was mostly my fault. 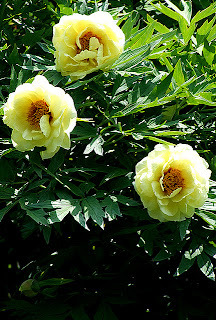 Tree peonies, like herbaceous, love full sun. They also do not like wet feet, which I think is where some of my problems arose. Tree peonies can be quite expensive so losing one not only hurts your garden plan, but also your wallet. They can range from $20 at a garden centre to over $250 online for extremely unusual varieties. In my garden I have (or had) pink, red, yellow, white/red stripe, burgundy and purple. They also are available in single and double flowers. They’re absolutely gorgeous. I have seen pictures of tree peonies growing in Japan that are centuries old and very large. If I remember correctly one year a very old plant counted in excess of 100 blossoms. Can you imagine? There are many online vendors if you are interested. Two reputable one are Cricket Hill in the USA (http://www.treepeony.com/Onlinenursuries.htm) and Garden Import in Canada (http://www.gardenimport.com). 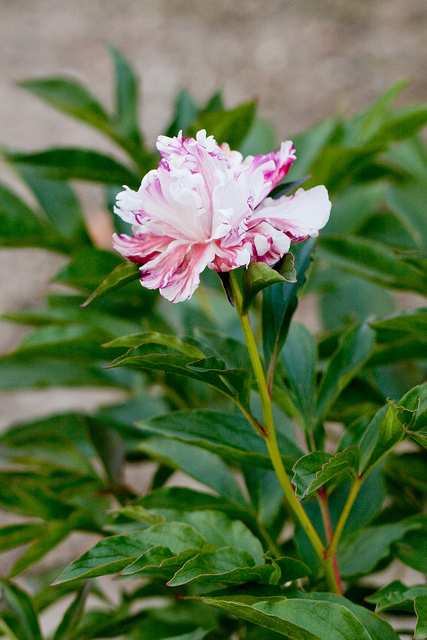 Potted peonies can be planted at any time during the growing season. My only caution would be in Fall planting. Like any other perennial you have to give them enough time to settle in before the frost arrives (in Nova Scotia, mid-October if we’re lucky). If you want to relocate or divide an existing (herbaceous only) peony it is best to do it in the early Fall. Peonies will do best in full sun, and a somewhat sheltered location. The shelter just helps the plant (either kind of peony) because the flowers are so large they tend to droop. Any strong, open wind can toss them around and shorten your enjoyment of the blossoms. 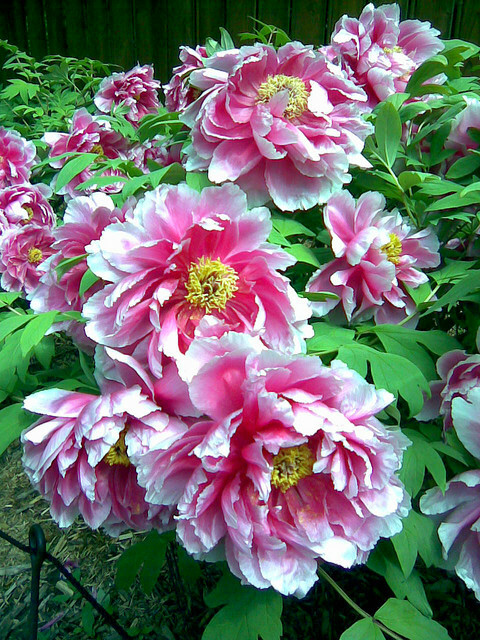 Tree peonies will actually produce viable seed. 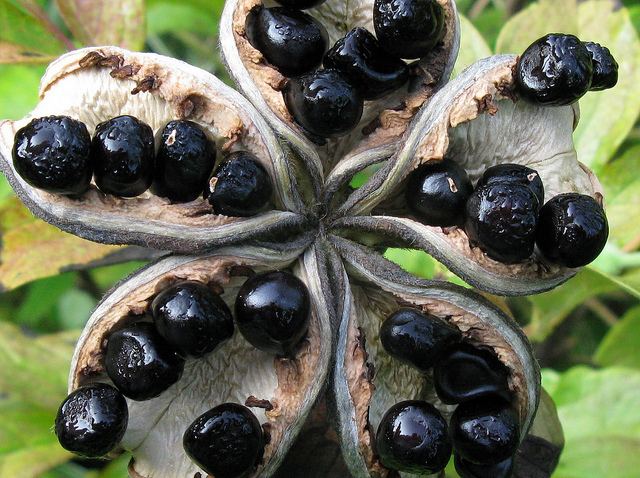 If you're up for adventure collect in the fall after the seed pods crack open but before the seeds drop. The seed themselves will be nearly black. They do not necessarily grow true to form, so you may (after years of patience) have something new and unexpected! Dig a hole at least 12” deep (or deeper) and mix in compost and some bone meal. Peonies prefer neutral to slightly alkaline soil. Make sure that some of your amended soil is a few inches deep in the bottom of the hole. Then place your peony root ball on top and back fill the rest of the hole. Ants on your peonies? No problem. There’s an old wive’s tale that ants are necessary for peonies to bloom. Although this is not true, ants are drawn to the nectar that is part of the budding and blooming process. They do no damage. Usually the ants are gone by the time the blossoms open. If you are cutting for indoor enjoyment give them a little shake to dislodge any hidden critters. Tree peonies will give you years and years of early summer enjoyment and will reward your care by increasing year over year.